A recipe that can be a starter or side dish is always good to have in your repertoire – impress your guests with this easy winner. 1. Preheat the oven to 200 ˚C and place mushrooms on a baking tray. 2. Mix the oils, parsley and lemon rind and season to taste. 3. Brush the mushrooms with two-thirds of the oil mixture and roast for 15-20 minutes or until just cooked. 4. Crumble the cheese over the mushrooms and roast for another 5 minutes, or until the cheese has melted. 5. Meanwhile, stir the remaining oil mixture into the avo and season to taste. 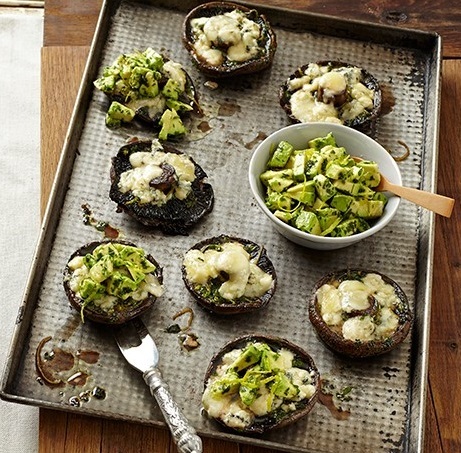 Spoon avo mixture on top of the mushrooms and serve hot or at room temperature. Cook over the braai: Place mushrooms over medium coals and braai for 10 minutes or until just cooked, add cheese and allow to melt.